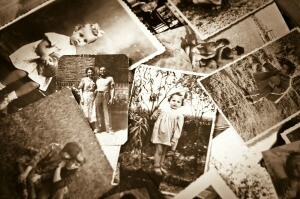 Before cell phones we all accumulated boxes and albums of photos. Organizing and finding safe storage places for these family treasures can be daunting. This is a guide about storing photos. I was cleaning out some file cabinets to sell today and happened to find a shoe box full of photos. I picked it up, the phone rang, and I sat it down. When I came back, it turns out I had set it on the rungs and holy cow if it didn't fit! 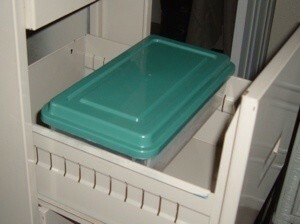 Depending on the style you get, you can slide it back and forth, then you can fit two in a standard drawer, with a gap in the front or between them for your hands. It's a nice way to keep thing horizontal if you need them to be and still keep flat things underneath! Keep the lids on for dust protection or off for easy access. Great for all the things that clutter up the desk! Does anyone have a better way to store family pics? I currently have mine stored in photo albums, but over the years the clear plastic that folds over the page won't stick anymore and the pictures keep falling out. I really don't like stashing my pics away in photo boxes because they seemed so unorganized that way. I find it very enjoyable to look at pics in the photo albums when company arrives or simply alone. Any suggestions? I use albums that have clear vinyl pockets that hold 4x6" photos. When I have smaller photos I can put 2-3 in each pocket. I used to use the ones that sound like what you discribed and when I wanted to switch albums, I had an awful time getting some of them out, because they stuck to the pages. Digitally is great, as suggested. I scan mine, then keep them in folders by person, groups, etc. They are my screen saver, and I also back them up on an external hard drive and DVDs. If you have a really great editing software like Paint.net or the one on your scanner, you can get a great quality as well as send them to others at a moment's notice. 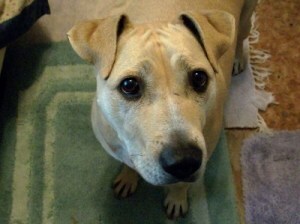 I included a shot of my friends dog so you can see what I mean. It's a bit time consuming, but it's all worth it in the end. I hope these all help. The best albums for prints are the kind with pockets, but not vinyl pages, as the PVC is not archival and will eventually damage the photos. A company named Century Photo makes pages of polypropylene which is safer for long term storage. There are many page formats available, for different sizes of photos, including 3x5, 4x6, 5x7, 8x10, etc. They also sell albums in different styles, sheets for negative storage, and other accessories. I really like their products, and, no, they aren't paying me to endorse them! :-) I pasted the url for their website below. I hope this helps. The "magnetic" pages from the 70s and 80s really were bad for our photos, so I converted my old albums to the poly-pocket type in the 90s. I'm overwhelmed with old photo prints, 3 or 4 generations worth. Any suggestions on sorting, and storing? I'm not a scrapbooker, but eventually, would like to do one for each of my children. I'm also into genealogy, so would like to keep that in mind for the old family photos. Thanks, y'all. I do so agree with Chloelizabeth. Label everything you can. If you've any family left, ask them. If you're lucky enough to still live in the place you were brought up, ask the villagers, some-one may know something. Even if it is only 'I think that's so-and-so' write it down, qualified as a possibility. I have a WWI photo of a man in khaki and four great-uncles it could be, or perhaps it's none of them. It would be so fascinating to know. When they've gone from memory, they're gone forever. I'm still working on organizing my photos, but the first thing I did was label all of them with at least the year and who was in the picture. Next I sorted them by year. My friend gave me a nifty photo organizer, and it was perfect. It was just a box with dividers built into it, but it was just what I needed. I have a digital camera now, and every time I take the photos off the camera, I rename the file with the year first, then month, then day and then who is in the picture and/or the place the photo was taken. NO photo is allowed on my computer if it hasn't been properly labeled. This philosophy keeps me from being lazy about labeling and then having to label hundreds of photos at once. On my computer I have the photos saved in folders labeled with the year, and inside those folders, I have the month folders. I save the photos in the corresponding folders. Someday maybe I will have my scrapbooks done, but for now, it is good enough to know my photos are all labeled and sorted. Yes, I do have a backup of my photos. I'd hate to lose them. I need to make space in my house quickly. I am wondering if I can store photographs in a storage shed that is not temperature controlled. Most are still in original the envelopes they came in once developed at the store. I know there are safer ways, but I am pressed for time. Hopefully this is for a few months; weather here is cold, but little snow (for humidity). I don't recommend a shed for your photos. It is recommended to store your photos in a cool environment, away from heat/humidity. This is not a good idea. The change in temperature will ruin the photos. Do you have a friend or neighbor or family who can take the photo boxes for you? I would not put them outside in a shed, in a basement or attic. Photos are extremely sensitive to temperature, humidity, and can be ruined very quickly. I hope you are able to borrow some space and keep them safe. If you absolutely must put them in a shed, remove the negatives and keep them inside, that way if you had to you could reprint...but that is expensive and a challenge these days to find places to even do this. I agree that placing photographs in storage shed would not be a good idea but I have had success using under bed storage containers so maybe that would work for you? If the need is immediate then try using heavy duty grocery type paper bags until you can make other arrangements. Place photographs in paper bags, laying flat, and slide under bed or even under a chair until you can find a better storage area. Try not to place in bathrooms, kitchen area or laundry area as these areas have too much moisture.